FIAT now has a full lineup of vehicles, but it was the cheerful and recognizable 500 model that helped the brand re-enter the US market in 2012. It’s undergone incremental mechanical and stylistic improvements in that time, but there are no changes for 2019. As before, the 500 continues to be available as a hardtop Hatchback version and a retractable soft-top Cabrio version. Both styles include seats for 4 people, but the back seats are pint-size and meant for occasional use. Think of them as being about as useful as the ones you’d see in a sports car. What’s more, there’s a minuscule 9.5 cubic feet of space behind the 50/50 split-folding rear seat, but it increases to as much as 30.1 with the seat out of the way. Like last year, the 500 comes in one of two mechanical flavors. The base setup is a 1.4-liter turbocharged inline 4-cylinder MultiAir engine, producing 135 horsepower and 150 lb-ft of torque, driving the front wheels. Also included are a performance suspension and performance brakes. Meanwhile, the Abarth version of the 500 gets the same basic engine, souped up to 160 hp and 170 lb-ft, a unique exhaust, and a three-mode stability control system. Either configuration comes with a standard 5-speed manual or optional 6-speed automatic transmission. Fuel economy ratings aren’t available as of this writing. For 2019, you can select the from Pop, Lounge, or aforementioned Abarth levels, in either Hatchback or Cabrio form. The Pop trim comes standard with 16-inch titanium aluminum wheels, a 5.0-inch touchscreen with streaming audio and hands-free calling, keyless access, heated mirrors, projector-beam headlights, fog lights, a sport spoiler, a 7-inch instrument cluster LCD, and cloth upholstery. The Lounge trim is a bit nicer, with 16-inch painted aluminum wheels, leather upholstery, heated seats, chrome side mirrors, a fixed glass roof for the Hatchback variant, satellite radio, automatic climate control, and a premium audio system. Finally, the range-topping Abarth comes with distinctive scorpion badges, black aluminum wheels, perforated-cloth seats with luxury floor mats, red brake calipers, a leather-wrapped steering wheel, and a leather-wrapped shift knob. The 500 is behind the times in terms of safety technology, so the only things you’ll find are a standard reversing camera and optional reversing sensors, The Insurance Institute for Highway Safety (IIHS) last evaluated the model in 2017 for crashworthiness, deeming it poor at protecting from small-front overlap collisions, but excellent in all other categories. 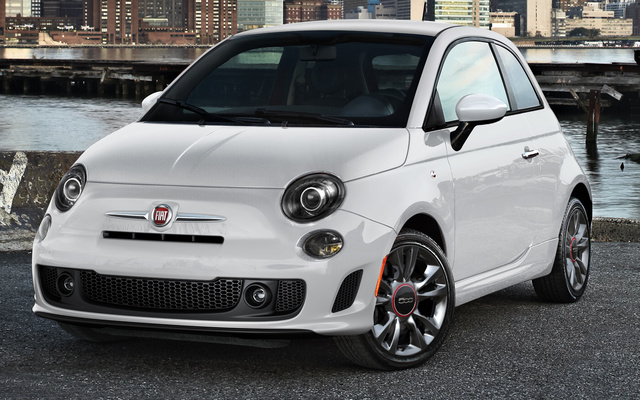 The FIAT 500 is one of the few modern vehicles that reaches through the ages with a clean, timeless design. It’s also extremely affordable, with even the nicest versions topping out at under $22,000. And though it’s short on tech features and definitely space, it’s still a solid choice for a stylish motorist with economical needs. What's your take on the 2019 FIAT 500? Have you driven a 2019 FIAT 500?